Sometimes, during grilling season, we get so excited about firing up the grill for the traditional Wisconsin summer fare (bratwurst and our pleasantly snappy natural casing wieners) that we forget to mention one of our very favorite things to grill: Applewood Smoked Pork Chops. We trim our chops by hand, cure them, and then slowly smoke them over logs of sweet Wisconsin Applewood. Each chop is pre-cooked, so all you have to do to get them ready to serve is warm them gently (medium heat works well), for a few minutes on each side, on your grill or in a pan. They make a really impressive entrée and have a quick, simple prep, so they’re a natural go-to for easy summer meals. 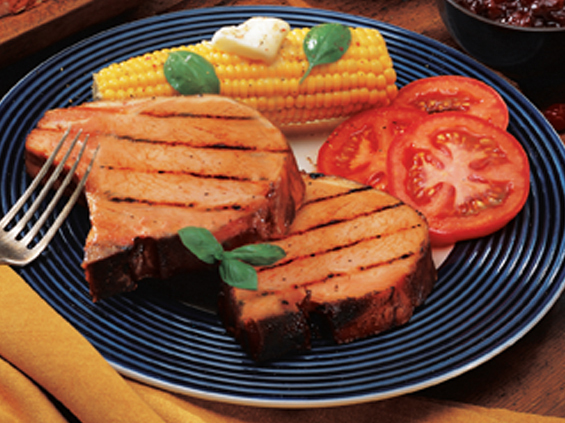 Guests are always impressed by these tender, rich smoked pork chops served hot off the grill. These big, half-pound bone-in chops are perfect for casual grilling or for a more formal dinner. If you do the later, we suggest pan-frying and glazing the chops with a recipe like this one, for Smoked Pork Chops with Maple-Glazed Apples. We have both boneless and bone-in Applewood Smoked Pork Chops available and ready for your next backyard get-together!